My painting hopes to bridge the gap between the animals typically seen as food, and animals we would consider 'pets'. Living a life of compassion towards all creatures means there is no difference. Meet Fido the pig! Pigs are on par with a dogs intelligence, and around the same as a 3 year old human child! 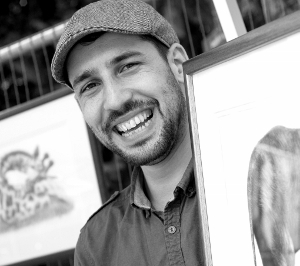 A former soldier who discovered his artistic talent on tour in Iraq, Gareth is now an Oxford based Artist creating endearing wildlife art in pencil, paint and charcoal. His work focuses on capturing the soul and the character of each animal he portrays. For the Go Safari project, Gareth created three life size sculptures, a giraffe, a gorilla and a lion, which were displayed around the UK. Through this project Gareth raised thousands of pounds for the Born Free Foundation. At 2014's International Art Fair Gareth was a guest judge, and he now teaches and demonstrates his art techniques in and around Oxford. Gareth has been a guest on BBC radio Oxford numerous times discussing veganism and the meat industry. He was the winner of 'PETA'S sexiest vegan 2014', later appearing in a cooking show for PETA promoting vegan products, such as Vegusto cheese. Based in the UK, Gareth accepts commissions.